I think what sets my company apart from others is the difference in my story. Mine causes me to live and work differently because where I came from and what I have endured and is what shapes the way I run my business. Meet April’s Woman of the Month! Sheran Keyton is entertainment. She is a professional writer, director, producer, actor, singer, youth mentor, and overall superwoman. She is defined by critics as “a force of nature” and “DFW’s Darling Diva” and has the heart to match. Sheran first began singing at the age of four in her church youth choir here in Fort Worth. Her father was a soul singer and growing up she would sit in his rehearsals on the weekends as a way to spend time with him. Between that and watching the older kids every Sunday, Sheran knew that performing was guaranteed to be in her future. Her dad was also responsible for her getting ‘bitten’ by the ‘acting bug’ at an early age. When she was about six or seven years old, he directed and produced a short film about The Atlanta Child Murders. “I appeared in that film,” she said, “and once again knew what my journey was really to be.” From there, Sheran spent most of her creative outlet time singing in the church choir and later added school choir and theater to her daily curriculum. Once in school, she was finally able to learn some much-needed techniques. “I was fortunate enough to have solid mentors placed in my life,” Sheran said, “lack of resources, opportunities, and flat out know-how led me to be a young starving artist with no sense of direction and they gave me opportunities that my single mother couldn’t otherwise afford. I made it a point to seize every opportunity and learn at every turn.” Sheran’s lust for learning and growing never stopped. She studied and analyzed directors, producers, choreographers, and technical people in action. “During show rehearsals and filming, other actors chatted among themselves as they awaited their return to work,” Sheran recalled. “I, however, was watching the process very closely because I wanted to learn all I could.” She continued to self-study and later figured out how she could work with others who would let her use the newly acquired skills. And what a life this amazing woman now leads! Her career is multi-faceted but her day-to-day job title is Manager of Education and Community Engagement for the Fort Worth Opera, the oldest continually performing opera company in Texas. Aside from continuing the long tradition of taking opera performances into schools throughout North Texas, she has also formed solid relationships with area organizations. One of her personal goals was to create and to host an art-focused summer intensive for young students and in the summer of 2018, that dream was realized and has since culminated into a pilot program with FWISD. Sheran is also the Owner and Artistic Director for DVA Productions, which is a constantly evolving non-profit education outreach company dedicated to supply arts integrated programing for those who have been otherwise underserved. In 2011, DVA produced their first season including original musicals, music revues, dramas, comedies, and a one-night arts events for adults. During that time, DVA also created a youth mentor program called DVA Young Artists. Young Artists was designed to give a select group of performers affordable (or free) musical theater classes, opportunities to perform, and the ability to travel to cities across America to experience different cultures of art. While traveling, the students in this program were able to sightsee, attend music or theater events, take master classes, and perform for students in that city. “This was mostly gifted to them by myself and a couple of other people who supported my vision.” Sheran said. Since 2016, DVA has returned to its original mission of producing educational outreach programming in local schools and includes creating regular programming, curriculum writing, and mentoring of young local artists. Sheran and DVA Productions now partner with other organizations, local libraries, and many DFW city government entities to continue this impact in underserved communities. “I think what sets my company apart from others is the difference in my story.” Sheran says, “Mine causes me to live and work differently because where I came from and what I have endured and is what shapes the way I run my business.” Don’t let these job duties fool you, Sheran is also still actively acting on stage, as well as in film and commercials. “I also perform nearly every weekend with one of my two bands, The Coppertones, which has a Rock/Soul/Motown flair, and The Joe Rogers Trio, which has a Jazz/Blues/Neo-Soul/Broadway vibe.” She spends the rest of her spare time as part of another creative team and stays busy writing, directing and/or producing independent on-camera works such as short films, feature films, music videos, television shows, and documentaries. Sheran is the soul-filled kind of woman who seems to have 28 hours in a day instead of the normal 24. Every spare minute she has left is spent serving others. Aside from all of the years Sheran has spent near the stage and cameras, she still greatly enjoys serving her community in many capacities. Sheran volunteers in the homeless community, mentors and creates programs for young performers from underserved communities, and is an advocate for racial injustice. While she enjoys the stage and all of the accolades, she is equally as happy spending time with her family and friends, especially her now adult children ages 18 and 25, whose careers she helps to manage. Her overall motivation for everything she has and continues to achieve stems from her desire to give her children the best possible life. What Sheran loves about Fort Worth is two-fold. The “superstar” in Sheran loves the bright lights of our big city. The “homebody” in her loves the southern comforts of our small city vibe. Fort Worth, according the her, is the perfect mixture of the two-a big city with the perfect small town charm to make you feel right at home. Passionate is the word to describe Sheran’s impact on Fort Worth. While it seems like a very unorthodox adjective when describing one’s impact, it is extremely accurate. Sheran is so very passionate about her work. She has taken emotions from her past as well as a vision for her future and that combination allows her to be fully herself: a morally sound, solid, strong, smart, and stunningly saucy businesswoman in Fort Worth. Bottomline, if you have not heard this woman sing or met this beautiful soul, it’s time to find her. 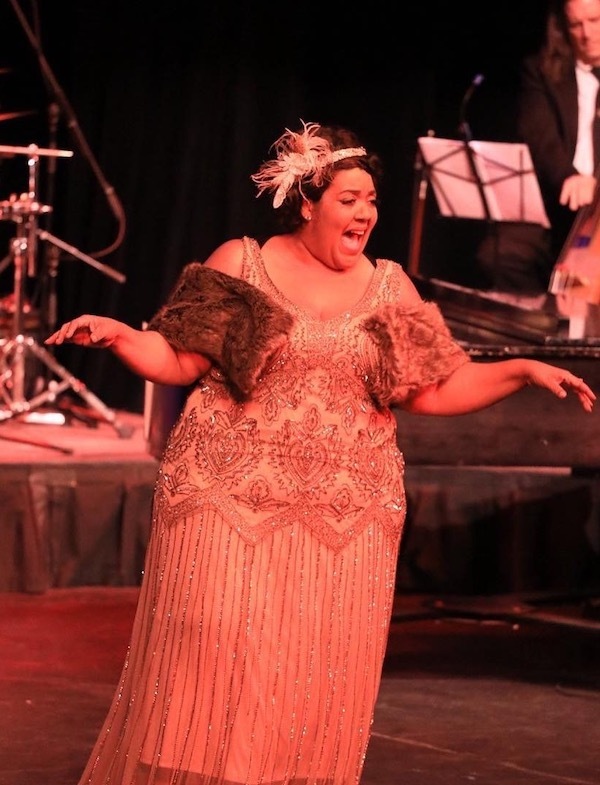 With a heart of gold and voice that’s silky smooth, Sheran Goodspeed Keyton is a force to be reckoned with. To find out more about her, visit sherankeyton.com or her company at dvapoductions.org. Also, make sure to follow her on Instagram: @DivaDFW, Facebook: @SheranGoodspeedKeyton, and Twitter: @sherankeytons.